We’d love your help. 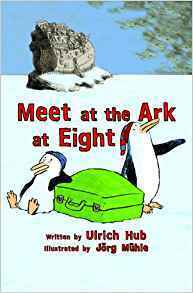 Let us know what’s wrong with this preview of Meet at the Ark at Eight by Ulrich Hub. Roman - métaphysique - Dieu. To ask other readers questions about Meet at the Ark at Eight, please sign up. Since I have been on this reading journey, I have been wanting to share my love of reading with my son. He has now taking a real liking into reading books that are not just the school books he’s given in class. So when this read came along, it was a nice opportunity for us to read it together. Needless to say that he enjoyed it immensely. “Meet at The Ark at Eight!” is the lovely retelling of one of the most famous biblical myth ever told: The Story Of The Great Flood. As far as children books go, Since I have been on this reading journey, I have been wanting to share my love of reading with my son. As far as children books go, it’s a very good approach to answer one of the greatest questions we’ve been asking for centuries. Is there a God? Well, let me tell you right away that the answer to this question is not in this book :). What you will find however, is a way to introduce the concept of faith and the belief in something much bigger than oneself, powerful, unseen and everywhere. As a parent, I wish I had come across this book earlier as questions on faith coming from children can be very difficult to answer. This story which explores the good and bad side of humanity is told via the voices of 3 penguins and an overworked dove in a language that will talk to young children, it is also accompanied by the lovely illustrations giving an added dimension to the words. It goes beyond the original story by also introducing forgiveness, acceptance and tolerance of differences. Ένα βιβλίο-ψυχοθεραπεία γέλιου για μικρούς και.... μεγάλους. Πρωτότυπο και μοναδικό, σε ταξιδεύει με το μυαλό, τη ψυχή και τη καρδιά. The animals went in two by... three?! Very funny. I can see that it's going to annoy a few readers who take these stories more seriously, but for anyone who can look at the Noah's Ark tale and enjoy mockery, question-asking, irreverence - this is great. Three penguins are living their lives in relative (dis)harmony when the Dove flies by with an invitation for two to an exclusive sea-borne rescue craft - the world is about to be flooded, they need to be on board at eight o'clock or miss out. But t The animals went in two by... three?! What happens next are a few funny little episodes on board the ark, with some amusing sketches of what might happen if an extra penguin was smuggled aboard and had to keep his head (and beak) low. Translated, you wouldn't notice this isn't originally an English story, it's very funny with some memorable penguins (and a dove) - it would make a good stage play actually - and even with some metaphysical questions posed on God and His morality/decisions. I haven't yet read this to/with my 7-year-old but I think he will find it as comical as I did, and I think he and I will have some discussions about the content. We've already talked 'religion' and this is a good route to starting analysis. Some good points raised regarding the Old Testament story, and a lovely way to look at a well-known tale from a new viewpoint. Vtipný pohľad na to, kto je vlastne Boh, prečo zoslal na zem potopu, a čo sa vlastne stalo na Noemovej arche. Una novela rarísima y muy original que reflexiona sobre la presencia de Dios en el mundo y en la vida de cada uno con toques humorísticos bien irónicos. I found this gem at its publishers bookstore a bit ago and read it out loud to the kids. We have a penguin lover in the house so it fit just right. There were two isolated instances but glaring errors in the book about God, which I edited out as I read. The rest was quite funny and offered differing views of God to consider. Is He a strict school marm who makes sure you dot your ps and q's? Or doesn't He much care what we do? Well, neither, really, but the book leaves this open ended. God and even I found this gem at its publishers bookstore a bit ago and read it out loud to the kids. We have a penguin lover in the house so it fit just right. The rest was quite funny and offered differing views of God to consider. Is He a strict school marm who makes sure you dot your ps and q's? Or doesn't He much care what we do? Well, neither, really, but the book leaves this open ended. God and even Noah are absent from the story, and some follow up is needed on this. I just read the flood story in Genesis 6-9, and readers of this book would do well to go there next. For a sampling of the quirkiness, The dove is an overworked "Martha." Nuh'un gemisi ve tufan hikâyesini üç penguen, bir güvercin ve onların gözünden anlatma fikri yeni ve eğlenceliydi. Yazarın anlatmaya çalıştığı şeyleri ise çok dolandırdığını düşündüm sürekli. Sorular, cevaplar, meraklar, fikir ayrılıkları, şüpheler ve en nihayetinde dogma olan dini inancın çocuklara penguenlerle anlatılmaya çabalanması. Uzun, çok uzun ve de benim gibi dindar olmayan biri için maalesef çok da ilgi çekici olmayan bir kitap. This book is quirky, and a bit too blatant in its message for my taste. I can see it being used to launch discussion in a philosophy or theology class for older students, but it does not suitable for younger readers (to me) because I don't believe they would find it interesting. російською вийшов переклад повісті, з цієї п'єси зробленої, і її я теж хочу прочитати – раптом там буде побільше пінгвіна-нігіліста. Zábavná a nie hlúpa knižka, o priateľstve, viere a tvarohovom koláči. Un divertente libro uscito in prima edizione nel 2010 e recentemente ripubblicato; tre pinguini conducono un’esistenza piatta e ripetitiva sul pack fino all’arrivo di una farfalla che uno dei tre uccide senza volerlo entrando in lite con gli altri due: iniziano perciò a dissertare sull’esistenza di Dio che vede tutto e condanna le azioni cattive. Nel clou della discussione atterra tra di loro una colomba grassa ed un po’ sbronza che annuncia il diluvio universale e li invita a porsi in salvo sull Un divertente libro uscito in prima edizione nel 2010 e recentemente ripubblicato; tre pinguini conducono un’esistenza piatta e ripetitiva sul pack fino all’arrivo di una farfalla che uno dei tre uccide senza volerlo entrando in lite con gli altri due: iniziano perciò a dissertare sull’esistenza di Dio che vede tutto e condanna le azioni cattive. Nel clou della discussione atterra tra di loro una colomba grassa ed un po’ sbronza che annuncia il diluvio universale e li invita a porsi in salvo sull’arca di Noè. Con uno stratagemma chiudono uno di loro in valigia in modo da poter partire regolarmente in due……………. La storia avrà uno sviluppo inaspettato. Battute esilaranti e scenette comiche lo fanno somigliare ad un copione teatrale; se non fosse per i pochi personaggi sarebbe adatto per mettere su una bella piece scolastica, ma al di là della leggerezza e della comicità è uno di quei piccoli capolavori che tutti i bambini dovrebbero leggere non appena imparano a farlo discretamente, perché fa ridere e pensare contemporaneamente, portando a riflettere sui tanti dubbi che affliggono l’essere umano. Un bel libro, dai 7 anni in poi, per interrogarsi sul mistero dell’esistenza di Dio e sull’accettazione delle diversità. Μια ξεκαρδιστική ιστορία, όμως βαθιά φιλοσοφική, που ασχολείται με μοναδικό τρόπο με το θέμα της θρησκείας, της θρησκοληψίας, της φιλίας και στο τέλος, ακόμα και της διαφορετικότητας, της αγάπης, της ανοχής και της αποδοχής, χωρίς να δίνει στα παιδιά μασημένη τροφή, αλλά πολλές λαβές για να ξεκινήσει μια συζήτηση πάνω στα θέματα αυτά. Siamo tre piccoli porcellin.....no non è questa la favola!! Siamo tre pinguin, due grandi ed un piccin...siamo sulla buona strada. Questa è una favola moderna, molto delicata, divertente e oserei dire anche irriverente. Discernere di Dio in modo così leggero ma con profonde verità e non rivolto a credenti o atei, ma agli uomini inteso come essere umano che s'interroga sulla vita. PS: Dimenticavo è un libro per bambini, per quel bambino che ci portiamo dentro. Het verhaal begint met drie ruziënde pinguïns. Ze lijken erg veel op elkaar, maar als je goed kijkt zie je dat eentje een beetje kleiner is. Ze vervelen zich enorm. In het land waar ze wonen is namelijk niks anders dan sneeuw en ijs en ijs en sneeuw en sneeuw en ijs. En alles is alleen maar wit, wit en nog eens wit. De pinguïns vinden elkaar stinken en lopen daarover te bekvechten. Af en toe worden er rake klappen uitgedeeld. Op een dag gebeurt er eens iets anders. Er verschijnt een vlindertje. De kleine pinguïn vindt het een goed idee om de vlinder dood te trappen. De andere pinguïns vertellen hem dat je niet mag doden. Natuurlijk wil de kleine pinguïn weten van wie dat dan niet mag. Dit mag niet van God. Maar wie God is, en hoe hij eruit ziet, daar hebben de twee andere pinguïns ook geen antwoord op. Ze weten wel dat God alles gemaakt heeft. Al het sneeuw en ijs en ijs en sneeuw. (Hij had volgens de pinguïns dan ook niet erg veel fantasie). God heeft heel goede oren, ziet alles en heeft een heel goed geheugen. En als je iets doet wat niet mag, dan krijg je straf. De vlinder wordt toch per ongeluk dood getrapt. De kleine pinguïn loopt boos weg. Hij heeft de andere pinguïns niet nodig, en God ook niet. Op dezelfde dag gebeurt er nog iets wat anders is. Er komt een duif bij de overige twee pinguïns op bezoek. Hij heeft een boodschap. Een boodschap van God. De twee pinguïns moeten hun koffers pakken en naar de Ark komen. God is het namelijk zat dat de mensen en dieren altijd ruzie maken en wil de wereld laten overstromen. De twee pinguïns krijgen een ticket. Ze moeten om 8 uur bij de ark zijn. Het bericht van de duif is natuurlijk verschrikkelijk. De wereld zal vergaan. Gelukkig weten ze de kleine pinguïn van de verdrinkingsdood te redden en smokkelen hem mee op de ark. Ondertussen denkt de duif steeds dat hij iets vergeten is. Maar wat? Dat weet hij niet. Het moet wel iets belangrijks zijn. Wat dat is, daar kom je pas aan het einde van het verhaal achter. Sottotitolo: l’esistenza di Dio spiegata ai tre pinguini. Questa piccola opera d’arte è stata già tradotta in otto paesi Sottotitolo: l’esistenza di Dio spiegata ai tre pinguini. Questa piccola opera d’arte è stata già tradotta in otto paesi e ha vinto diversi premi in patria e altrove e se li merita davvero tutti intriso com’è di commovente ironia, amore per l’umanità in generale e verso gli animali in particolare e di profonda fede. In breve è la storia dell’Arca di Noè e di tre pinguini che devono salirci e di una colomba-messaggera alquanto sui generis ma questa sintesi non rende l’idea di cosa sia in realtà “L’arca parte alle otto”: è una storia che ci fa commuovere, ci fa sorridere ci fa riflettere grazie anche ai dolcissimi disegni di Muhle che sono il perfetto “pendant” delle parole di Hub. Voglio concludere con le ultime parole del libro che sono anche un inno all’amore non necessariamente etero perché uno dei tre pinguini e la colomba si sono innamorati dopo che, per necessità (e scoprirete quale solo leggendolo) si sono dovuti mettere in coppia: “da quel giorno la colomba e il pinguino sono inseparabili. Certo, ogni tanto qualche animale sostiene che le cose non devono andare così. I serpenti a sonagli, in particolare, continuano a dire che Dio non avrebbe mai ammesso un’unione simile. Ma la colomba e il pinguino non ci badano perché hanno trovato il vero amore”. What a delightful little book!! Sure, it is written for children (around 8-12 years old) but there is much to enjoy in this little book for adults as well. On the surface, it is a beautifully written and humorous story about two penguins who smuggle their third penguin friend on to Noah's Ark. In reality, it is a philosophical discussion on the nature and reality of the Divine in our lives that is reminiscent of Jostein Gaarder's modern classic Sophie's World. It subtly raises philosophical quest What a delightful little book!! Sure, it is written for children (around 8-12 years old) but there is much to enjoy in this little book for adults as well. On the surface, it is a beautifully written and humorous story about two penguins who smuggle their third penguin friend on to Noah's Ark. In reality, it is a philosophical discussion on the nature and reality of the Divine in our lives that is reminiscent of Jostein Gaarder's modern classic Sophie's World. It subtly raises philosophical questions about belief, morals, rules and who or what is the Divine; so much so that (without giving away spoilers) the final paragraph has a very clever comment about rattlesnakes and contemporary issues. Tre pinguini, molto amici, discutono sull'esistenza di Dio e su alcune sue caratteristiche assolute (Dio è invisibile, ha un udito finissimo, vede tutto, ha una memoria di ferro) e finiscono per litigare. Il pinguino più piccolo, offeso, si allontana. Arriva la colomba di Noè, informa i due pinguini dell'imminente Diluvio e consegna loro due biglietti (non cedibili) per salire sull'Arca. I due pinguini sono turbati all'idea di dover lasciare indietro il piccolo pinguino e, tra un sospiro e l'alt Tre pinguini, molto amici, discutono sull'esistenza di Dio e su alcune sue caratteristiche assolute (Dio è invisibile, ha un udito finissimo, vede tutto, ha una memoria di ferro) e finiscono per litigare. Il pinguino più piccolo, offeso, si allontana. Arriva la colomba di Noè, informa i due pinguini dell'imminente Diluvio e consegna loro due biglietti (non cedibili) per salire sull'Arca. I due pinguini sono turbati all'idea di dover lasciare indietro il piccolo pinguino e, tra un sospiro e l'altro, invece di salutarlo gli danno un bel pugno in testa e lo ficcano in una grossa valigia per portarlo sull'Arca come passeggero clandestino... La colomba, nel frattempo, ha dimenticato qualcosa, che sarà mai?! This is the story of Noah's Ark, as seen from the viewpoint of a couple of penguins and a dove. The dove has strict instructions from Noah to open any questionable packages. She bends down suspiciously over the suitcase and sniffs at it. "This suitcase smells like fish," she declares "Are you trying to smuggle a fish sandwich on board or something?" "It's us," the two penguins reply. "We always smell like fish." P This is the story of Noah's Ark, as seen from the viewpoint of a couple of penguins and a dove. Pleasant short read with gorgeous illustrations. Loved the penguins, liked the tale but I am not a huge fan of 'clever' allegorical tales. Amongst the silliness of this quirky retelling of the Noah's Ark story are some profound philosophical ponderings.